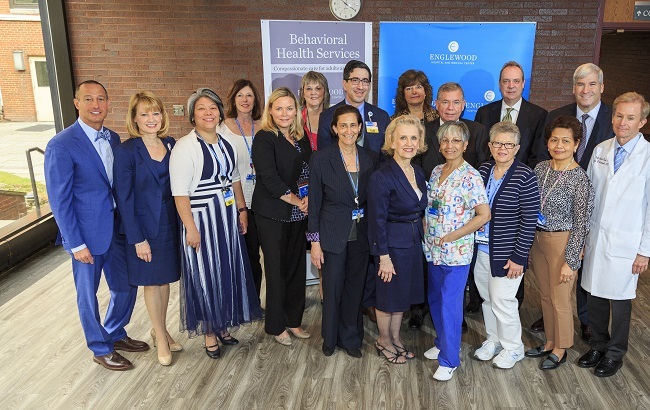 The behavioral health team at Englewood Hospital and Medical Center recently received the Horizon National Chiasson-Schmitt Partnership Award from Horizon Health, a national leader in behavioral health services. Dating back to 2003, the partnership between Englewood Hospital and Horizon Health has helped to ensure that patients receive high-quality and save behavioral health services in a compassionate environment. Pictured, the Englewood Hospital and Medical Center and Horizon Health administrative teams, along with the behavioral health team from Englewood Hospital.